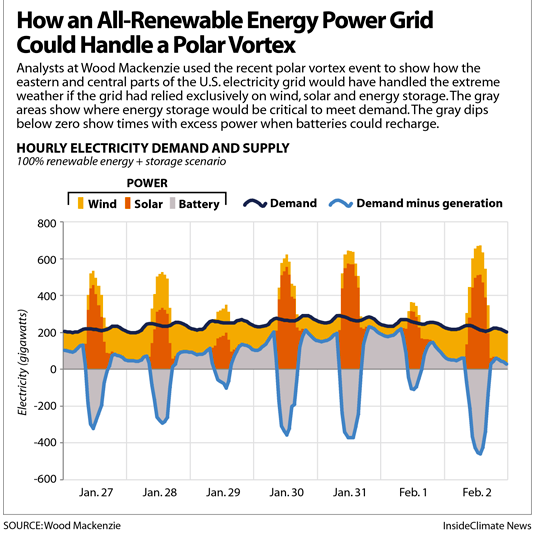 “You would need a lot more batteries in a lot more places,” said Wade Schauer, a research director for Wood Mackenzie Power & Renewables, who co-wrote the report (Note 1). 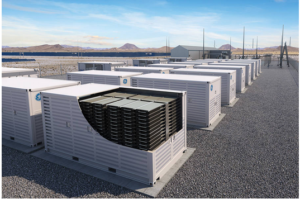 Energy storage is a key piece of the power puzzle as cities, states (Note 2) and supporters of the Green New Deal (Note 3) talk about a transition to 100 percent carbon-free energy sources within a few decades. 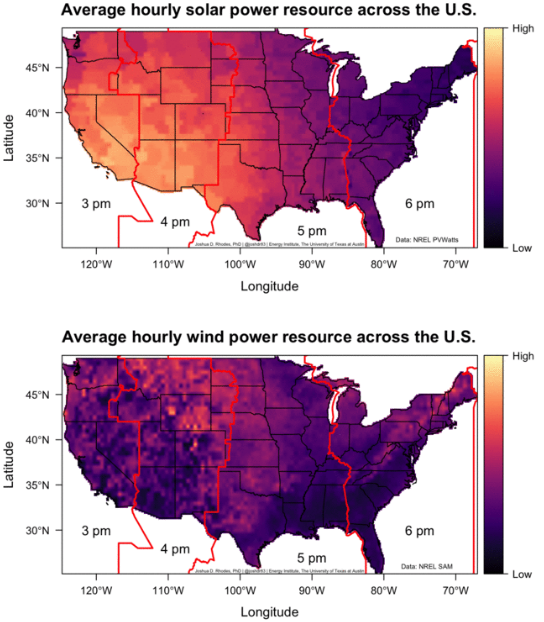 The country would need to transform its grid in a way that could meet demand on the hottest and coldest days, a task that would involve a huge build-out of wind, solar and energy storage, plus interstate power lines. “In a power grid, all these advanced technologies are driving the need for more flexibility at all levels,” said David Littell, principal at the Regulatory Assistance Project and a former staff member for Maine’s utility regulator. Grid operators have to meet constantly changing electricity demand with the matching amount of incoming power. While fossil fuel power plants can be ramped up or down as needed, solar and wind are less controllable sources, which is why energy storage is an essential part of planning for a grid that relies on solar and wind. Much of the current growth (Note 4) in energy storage is in battery systems, helped by plunging battery prices. A large majority of the existing energy storage, however, is pumped hydroelectric, most of which was developed decades ago. Note 5. Other types of systems include those that store compressed air, flywheels that store rotational energy and several varieties of thermal storage. The larger point is that such a transition can be done and is in line with what state and local governments and utilities (Note 6) are already moving toward. Feasibility is a key focus of the research of Mark Jacobson, a Stanford University professor, who has looked at how renewable energy and storage can provide all of the energy the U.S. needs. Note 7. Another important element is managing electricity demand, which is not discussed in the Wood Mackenzie report. Littell says some of the most promising ways to operate a cleaner grid involve using technology to reduce demand during peak periods and getting businesses to power down (Note 8) during times when the electricity supply is tight. Energy efficiency improvements have a role, as well. Note 9. Dan Gearino covers the U.S. Midwest, part of ICN’s National Environment Reporting Network. His coverage deals with the business side of the clean-energy transition and he writes ICN’s Clean Economy Weekly newsletter. He came to ICN in 2018 after a nine-year tenure at The Columbus Dispatch, where he covered the business of energy and won state and national awards for his work, including from the Society of American Business Editors and Writers and the National Headliner Awards. Before that, he covered politics and business in his native Iowa and in New Hampshire, working as a newspaper reporter and an occasional radio correspondent. He grew up in Warren County, Iowa, just south of Des Moines, and is an alumnus of Macalester College in St. Paul. He lives in Columbus, Ohio with his wife and two daughters. Reach Dan at dan.gearino@insideclimatenews.org.